Incompatible, when using wireless microphone, there is always interference between the system itself. Although each system has frequencies or intervals of several megahertz, Intermodulation Distortion (IMD) can still cause interference between microphones. If there is not enough space between the intermodulation signal and the device's operating frequency, it is difficult for the receiver to pick up the signal from the transmitter. Typical phenomena are crosstalk between systems, frequent signal loss or excessive noise and distortion. In order to avoid intermodulation distortion, choose the calculated frequency of mutual compatibility. This requires a wealth of transmitter and receiver design knowledge that is often calculated by wireless microphone system builders. For example, when only eight wireless microphone are used together, thousands of calculations are performed to ensure compatibility between the microphones. As a result, most manufacturers have released their system-compatible frequency list. In addition, software can be used to help users identify compatibility frequency under certain conditions. 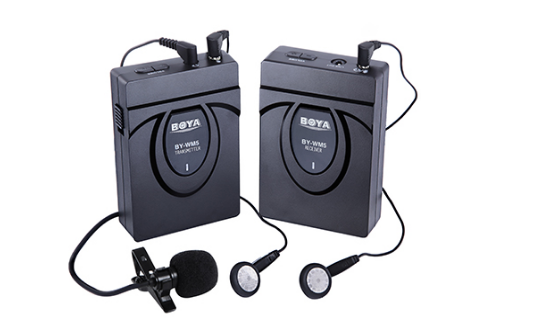 BOYA BY-WM5 wireless microphone is for use with DSLR cameras, camcorders. The 2.4 GHz GFSK system result in strong anti-interference, good security and stability. As a result, the software needs to be designed with enough room for intermodulation signals and wireless microphone. If you assume that the sound system operator is to play a more active role in the activity, then the system needs a wider range of compatibility. In this case, assume that the operator will silence all receivers and all transmitters will remain there during the show. The transmitter and receiver antennas are also about the same distance, and these assumptions are perfectly fine for the Broadway Theater, but in school auditoriums the systems are operated by untrained personnel and not much in the way of achieving the same expected performance It is possible. The receiving antenna of the wireless microphone is one of the largest areas of misunderstanding. Antenna selection, layout, and cabling errors can result in short distances in the performance coverage area and low signal strength, resulting in frequent dropped calls. Modern diversity receivers deliver far better performance than individual antenna types, but to optimize system performance and reliability, the antenna selection and placement must be correct.